Help Documents - Version 5 File Cabinet WizardHow do I upload files into the File Cabinet? The File Cabinet Wizard is a tool used to upload files into a central storage place. Files can be images, graphics, PDF files, Word and Excel files or any other file type. 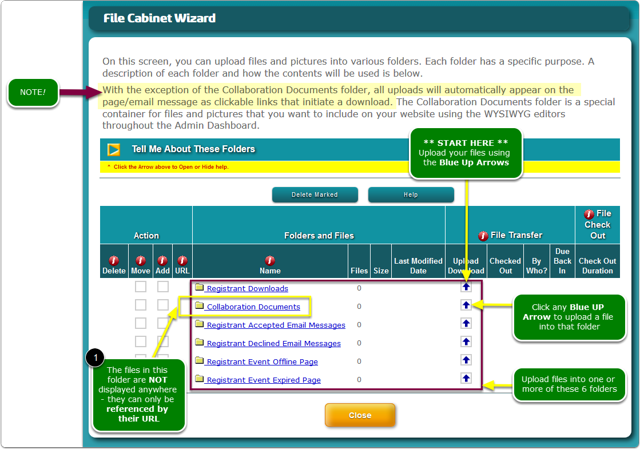 See this article: Which tool do I use to access the File Cabinet Wizard? Upload your files into any of the 6 folders. All files within a folder will automatically display on the page indicated by the folder name. If you want the file to be displayed in 2 or more places, then upload a copy to each folder. You cannot select which files will be displayed. If you need to exclude a file from the list, you must delete it from the folder. Into any WYSIWYG editor - How do I insert file links into a WYSIWYG editor? On to any web page - How do I insert a link to files using the File Cabinet Wizard? Into any question, sessions, sales item or any field or page that allows HTML - How do I insert a link to a file into a question, session, web page (<a> tag)? If the file is an image or graphic, the image or graphic will display. If its any other type of file, a link will be created that will download the file when the link is clicked. How are these 6 folders used? With the exception of the Collaboration Documents folder, any file in any of the other 5 folders will display as a clickable link to the uploaded file on the page indicated by the folder name. The Registrant Downloads folder is used to add files to your event's registration page. This is useful when you want to provide to your attendees additional forms, agendas, speaker's bios or speaker papers or any other documents. Any file that you upload into this folder will automatically display a download link on your registration page. The 2 files in the File Cabinet's Registrant Accepted Email Messages folder are automatically displayed as clickable links in the email message. 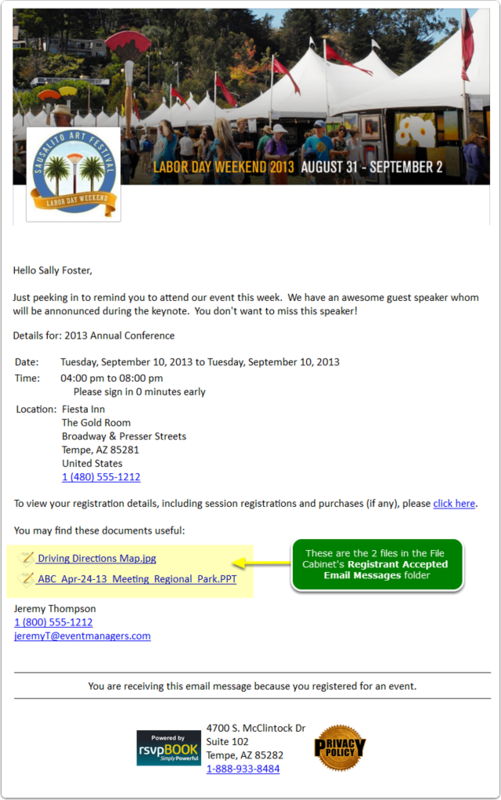 This example is a Reminder to Attend message AND has included the 2 files from the Registrant Accepted Email Messages folder because the event owner wants to make sure the registrants have access to them. This example was created with MERGE_CODES - How do I insert file links into confirmation email messages? Prev: Which tool do I use to access the File Cabinet Wizard? Next: Are you PCI Compliant?